Adroit Financial Services Pvt. Ltd. (Adroit) is one of India's leading financial market services company, providing a bouquet of capital market services including securities broking, advisory, depository, equity research, derivative, commodity trading, currency futures and IPO distribution. We offer the aforementioned services via our on-line and off-line distribution channels. Our strong base of partnered business associates, arbitrageurs, and online trading mechanism ensures premium quality service to our clients through various branches spread across India. Founded in 1994 by Mr. Ajay Kumar Gupta, the group focuses on staying relevant within an industry that is constantly evolving. Under the guidance of its founder, the group rapidly expanded its footprints across 250 locations in India with almost 1000 professionals serving more than 50,000 clients, including HNIs, institutions, corporations, individuals, and families. The group's philosophy is entirely client centric, with a clear focus on providing long-term value addition to its clients. We strongly believe in maintaining highest standards of excellence, ethics, and professionalism along with research-based value investing and implementation of cutting-edge technology. 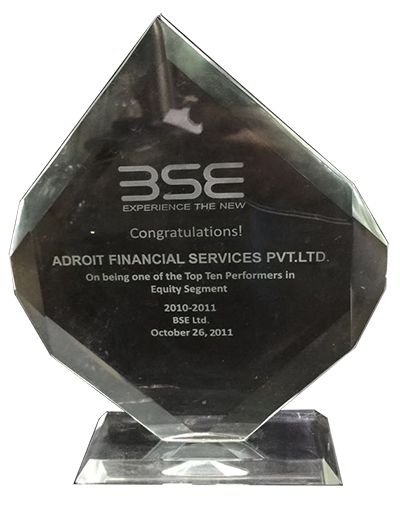 Adroit was among the top 10 volume drivers in BSE cash segment in the year 2008-2009. We currently hold membership of National Stock Exchange of India Ltd. (NSE), Bombay Stock Exchange of India Ltd. (BSE), National Commodities and Derivatives Exchange Ltd. (NCDEX), Multi Commodity Exchange of India Ltd. (MCX), NSE-SX, MCX-SX, National Securities Depository Ltd. (NSDL), and Central Depository Services Ltd. (CDSL). 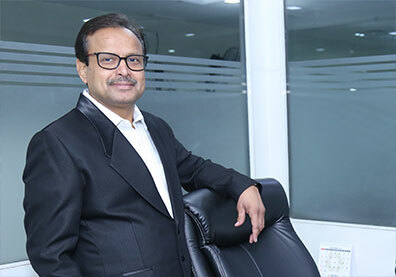 Mr. Ajay Kumar Gupta founded Adroit Financial Services Pvt. Ltd. in 1994.His vision was to create an independent stock broking house that offers solutions to its clients coupled with unmatched customer support to achieve a high-level of customer satisfaction. He is actively involved in managing the firm and keeps the focus firmly on taking the company towards innovation and leadership excellence across its core businesses. His extensive experience and diverse talent led Adroit to spread its footprints across India. Mr. Gupta successfully established new standards of derivative and arbitrage business as well as growth and development of the proprietary and asset management services in India. Under his leadership, Adroit not only navigated admirably through the dotcom bust and one of the worst stock market crashes but also grew from strength to strength. Often described as ebullient, focused, passionate, sincere, hardworking and dynamic, he has infused Adroit with his own brand of energetic leadership, vision and spirit. His keen business acumen and result oriented approach has made him excel in executing challenging tasks. With an illustrious career spanning across 26 years, he holds an esteemed position amongst his other capital market peers. 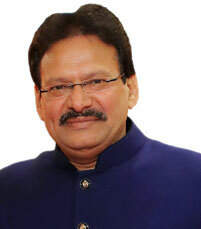 Mr. Atul Kumar Gupta is the Director of the Adroit Financial Services Pvt. Ltd. Backed by over 24-years of experience, Mr. Gupta is a well-known name in the Indian financial industry. He has a natural flair for nurturing and cultivating the culture of innovation and his out of the box thinking helps him to pick the opportunities that are not visible to others. Mr. Gupta is involved in taking strategic decisions and managing risks. He has also successfully helped the company to wade through the turbulent times in the financial markets. He has led several successful initiatives for the company in the past. Given his keen business acumen, Mr. Gupta has been solely responsible for scaling the derivatives business at the company. An able and proficient multi-tasker with an eye for perfection, Mr. Gupta has not only lived up to the expectations of his team as a leader but has also created high standards for everyone at Adroit. Our in-house research teamis among the best in the industry boasting of an unmatched and quality experience in the financial markets. We have a strong pan India presence in approximately 250 cities catering to over 50,000 clients. We have a state of the art Electronic Data Processing (EDP) Department establishing an efficient trading network by providing more than 100 lease lines, 12 VSATs platform, 3 MPLS, 14 P2P. We have a committed team of over 1000 employees working together to achieve a common goal. At Adroit, we strive to build lasting relationships with our clients by conducting ourselves with integrity and confidentiality. The customer has always been at the center of Adroit’s universe and we place their interests before our own. We work closely with our clients to equip them with the sound capability to address large and fast-growing market opportunities. Adroit is committed to delivering high quality results through our experienced team of professionals driven by ideas. Our people are our biggest assets and we work to excel and exceed the expectations of our clients every time. At Adroit, we have nurtured a “One-Team” approach. We offer a culture that is innovative, enabling and thoughtful. Our result oriented and merit based approach encourages our employees to achieve greater heights and gives them enough space to experiment. Adroit stands for the highest standard of integrity and honesty. Above all, we value the ability to serve our clients by honoring our commitments with highest ethical and business practices. We strictly maintain confidentiality and transparency in our business dealings. 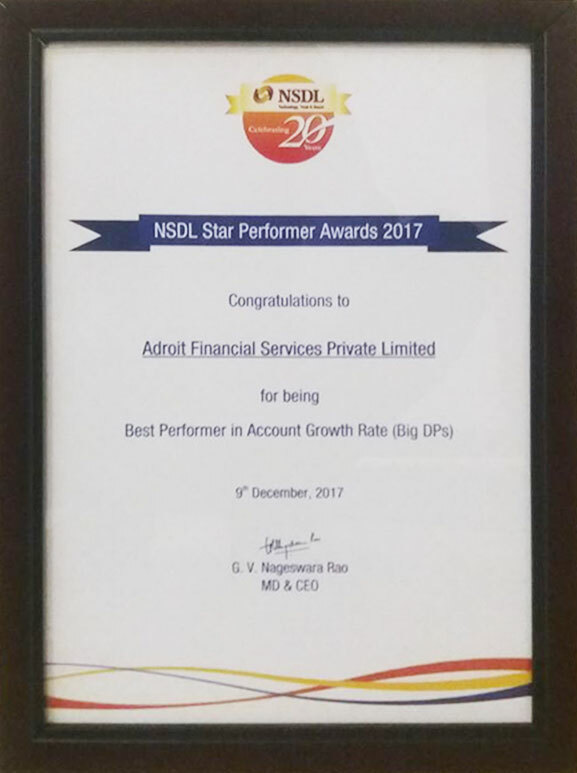 We received NSDL Star Performer award 2017 for Best Performer in Account Growth Rate (Big DPs). We received Cricket Extravaganza 2015 Award from NSDL. 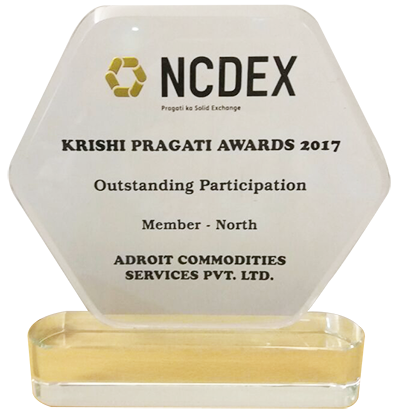 We received Krishi pragati award 2017 from NCDEX for Outstanding Participation. 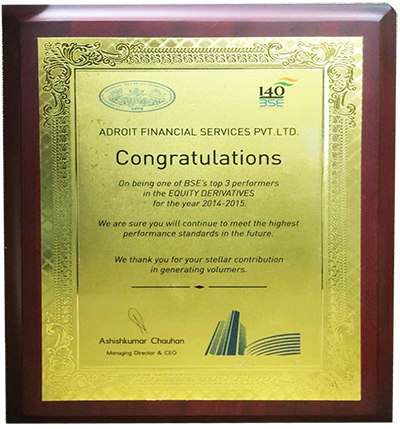 We received this award as one of the Top Ten Performers in Currency Members for the year 2014-15 from BSE. We received this award from 3rd International Convention of (CPAI)Commodity Participants Association of India in June- 2014. We received this award as one of the Top Ten Performers in Equity Segments(Retail Trading) 2012-13 from BSE. 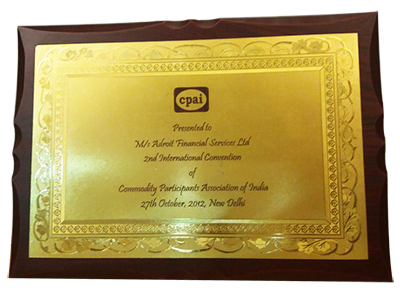 We received this award from CPAI 2nd International Convention of Commodity Participation Association of India in Oct-2012. We received this award as one of the Top Ten Performers in Equity Segments 2010-11 from BSE. 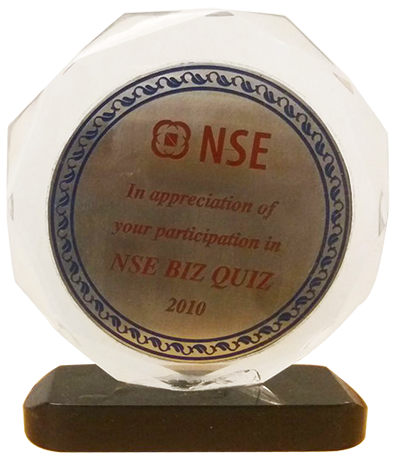 We received this award from NSE in appreciation of your participation in NSE BIZ QUIZ 2010. We received this award as Major Volume Driver 2008-09 Award from BSE. We received this award from 4th International Convention of Commodity Participation Association of India. We received this award from BSE in the field of Financial Services. 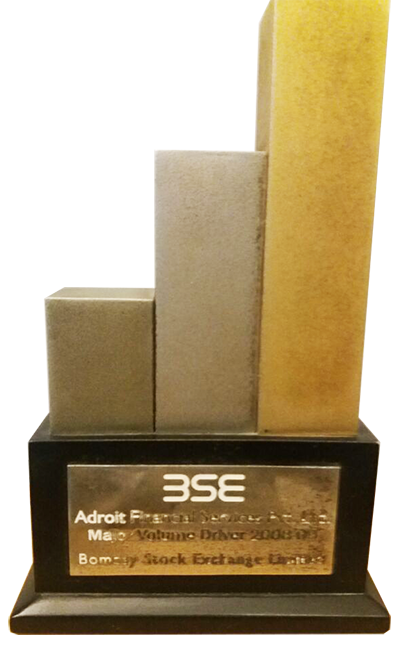 We received this award as Top Volume Performer in Equity from BSE. We received NSDL Star Performer award 2017 for Outstanding Performence. We received this award from Cricket Extravaganza 2016 from NSDL. 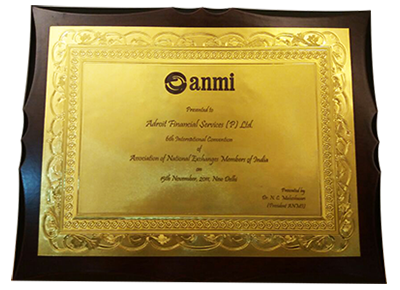 We received this award from Anmi(Association of National Exchanges Members of India) in November 2011.